When a road earns a title like “the most beautiful drive in America”, you’d better add it to your road trip list. 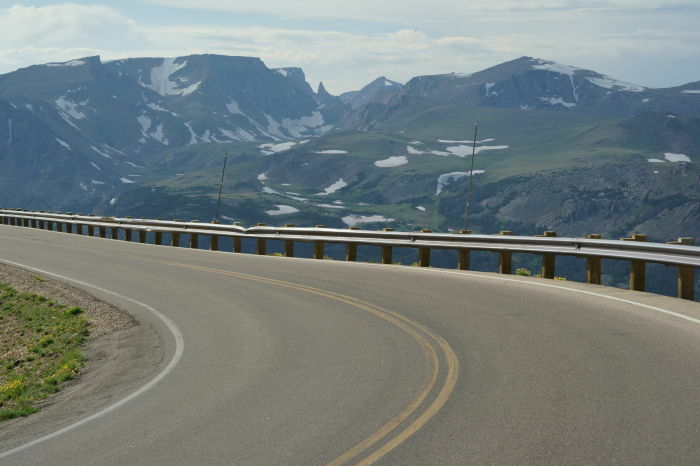 The Beartooth Highway lives up to those lofty expectations of sweeping curves and awe-inspiring views, with plenty of beauty to spare. It’s more than just a way to get to Yellowstone, it’s a destination in its own right, so plan to spend at least a day or more, if you have the time. 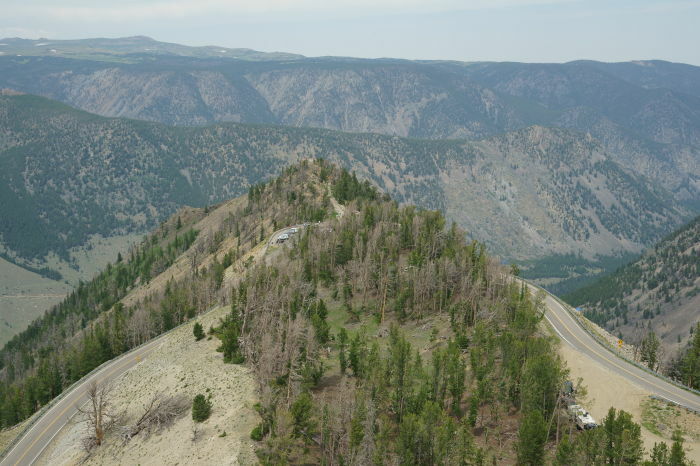 The Beartooth Highway is located east of the northeast entrance to Yellowstone National Park, along US Highway 212. 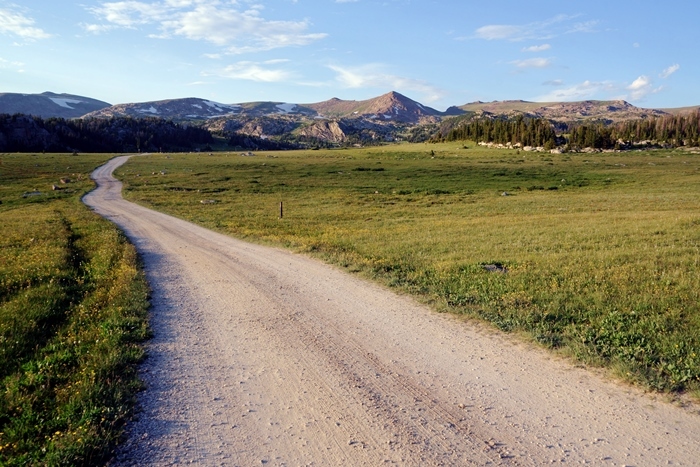 The title refers specifically to the stretch of highway between Cooke City and Red Lodge, Montana. From Red Lodge, US 212 heads south, crosses into Wyoming and over Beartooth Pass, before returning to Montana at Cooke City. This desolate corner of Wyoming and Montana isn’t easy to get to. 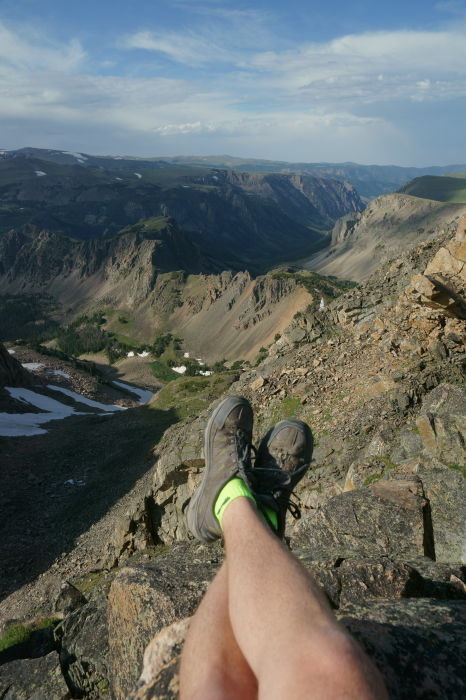 For years, I tried to plan trips that would take me to the Beartooth, but just couldn’t work out the details. When I finally got there in 2008, it wasn’t my lucky day. The entire mountain range was covered in fog, and a light drizzle spoiled any chance of properly experiencing this great highway. In 2017, I was much more fortunate. In order to maximize my chances of enjoying good weather, I decided to spend the night at a motel, half-way across the Beartooth — at the four-room Top of the World Store and Motel. That was an experience in its own right — and I’ve written about it on a separate page. Here, I’ll tell you what it’s like to drive across the Beartooth. US 212 leading up to Red Lodge isn’t very exciting, but after you pass through the town, things get interesting. 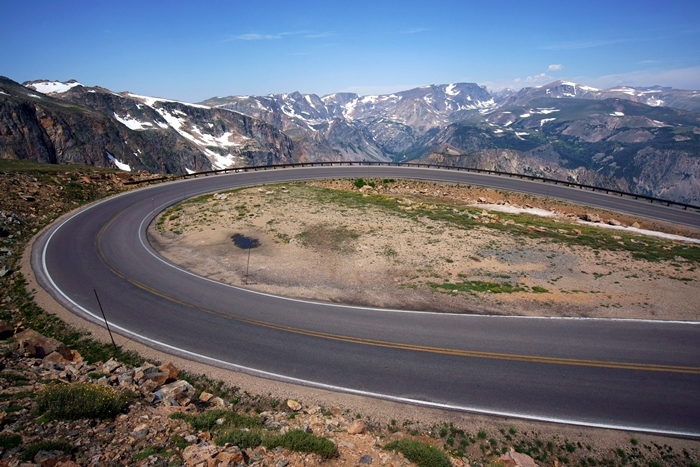 The Beartooth Highway begins its climb up to Beartooth Pass, with countless curves and switchbacks. The road has to climb from the bottom of that valley up to the top of the mountains. Look closely and you can see a few sections of the highway, down below. Rock Creek Vista provides a nice view, looking down on where you just came from. A short trail takes you across the top of a ridge, to a viewpoint. Up the road just a bit, you’ll be able to look down on Rock Creek Vista. The road eventually tops out, and it feels like you’ve reached the barren alpine tundra. But you’re not even at the pass yet! You’ll drive through this strange landscape for a while, before crossing into Wyoming. 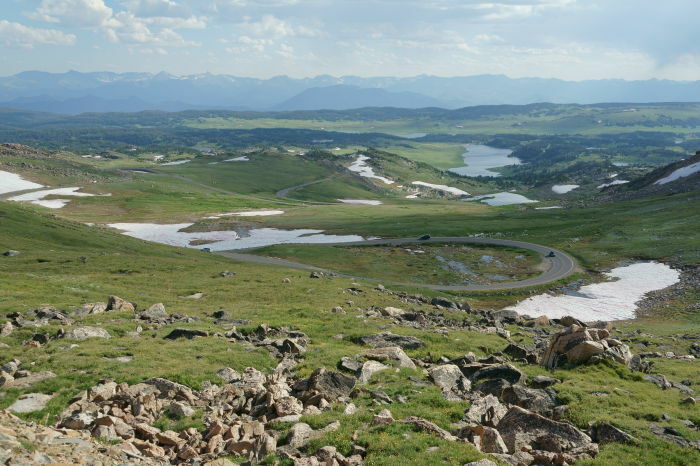 You’re already above 10,000 feet, but Beartooth Pass is still uphill. Shortly after the state line, watch for a turnout on the west side of the road (the right side, if you’re headed towards Yellowstone). This view of Twin Lakes is one of the most beautiful places on the Beartooth, but it’s unmarked, and you could easily drive by it. My picture doesn’t do it justice. 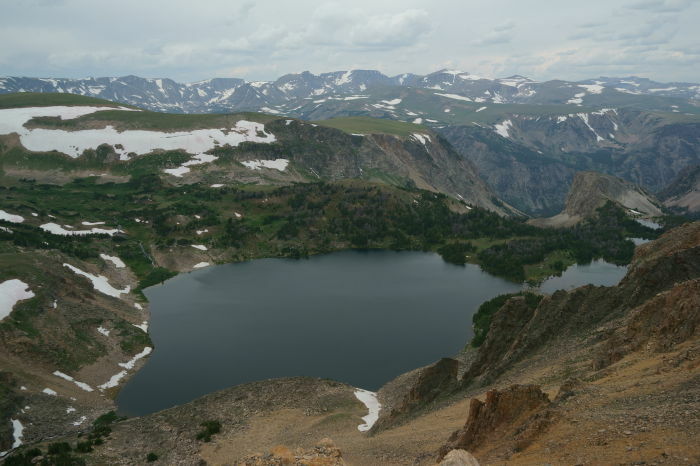 One of the best places to take a moderate hike along the Beartooth is at Gardner Lake, which is just below Beartooth Pass. I returned here the following morning to hike down to the lake, and I’ll tell you about that hike on a separate page. 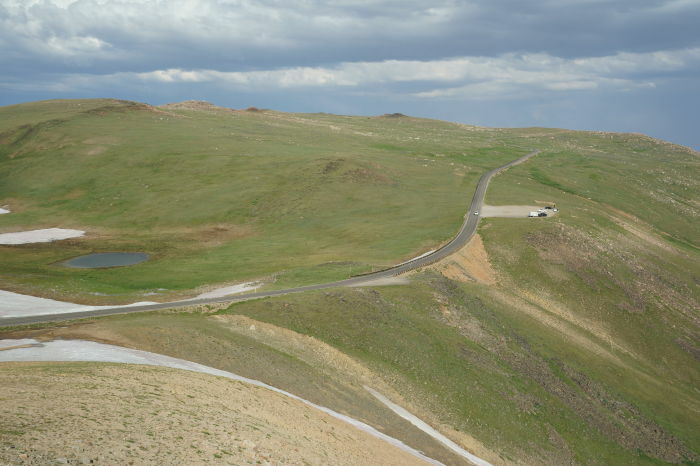 Beyond Gardner Lake, there’s just one more uphill climb to Beartooth Pass. … and you’ll spot a particularly jagged mountain peak on the horizon. I got a better picture of it after sunset. That’s the Beartooth. 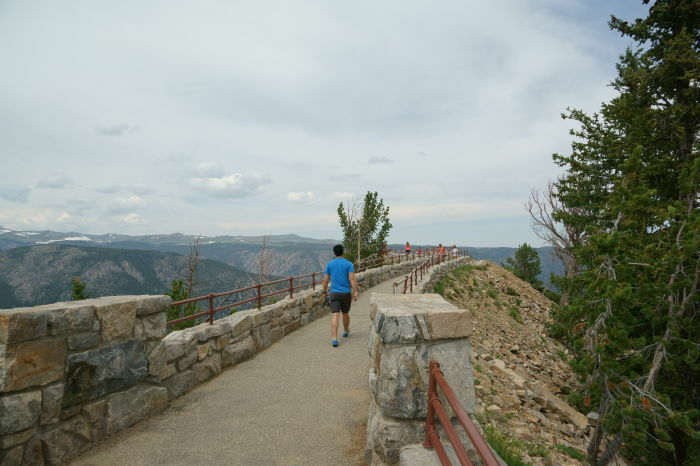 Be sure to see it here — because it can’t be seen from Beartooth Pass. I drove over the pass, and then on to the Top of the World Motel and checked in. I was starting to feel the effects of the elevation — and I knew I had to adjust because I’d be spending another 24 hours above 9,000 feet before heading down. Once I was in my room, I took some Excedrin and crashed for a couple of hours. I was worried that my midday nap would be a waste of time, but it actually gave the weather a chance to improve. Those hazy skies cleared out, and when I emerged from my room, the day had become much more beautiful. After that, I spent the rest of the day driving back and forth over the pass, exploring different areas. That means the rest of these pictures might not be in chronological order, but I’ll try to organize them in a way that makes sense. 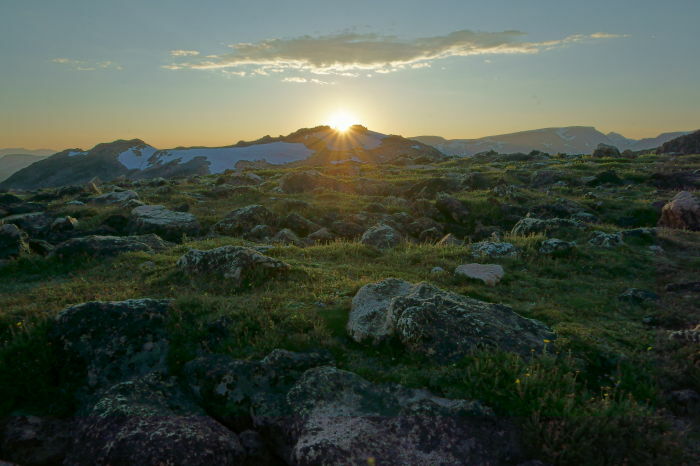 Let’s go back to Beartooth Pass, where I watched the sunset. At the pass, there’s a rocky field covered with boulders and moss. You can park here and walk around, hopping from rock to rock, as you discover the best viewpoints. It was a pretty good place to watch the sunset, with one solitary cloud perfectly centered over the setting sun. This is also your first chance to get a look at what’s ahead. 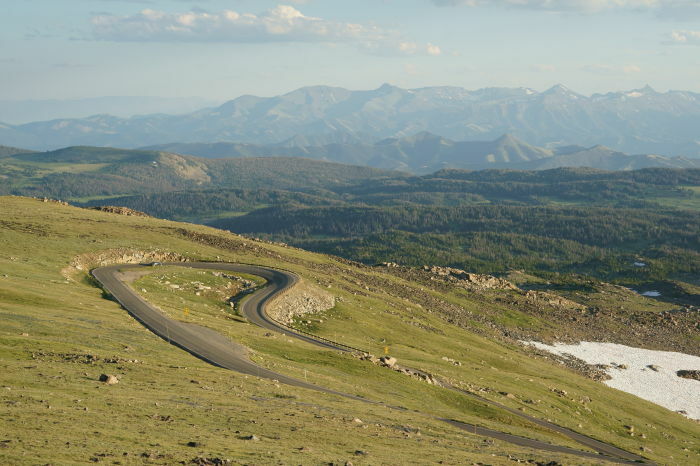 From the pass, the Beartooth Highway zig-zags downhill in a roughly southwest direction. Those hairpin curves are beautifully lit by the late-day sun. Looking south, the vast expanse of Wyoming stretches out in front of you. 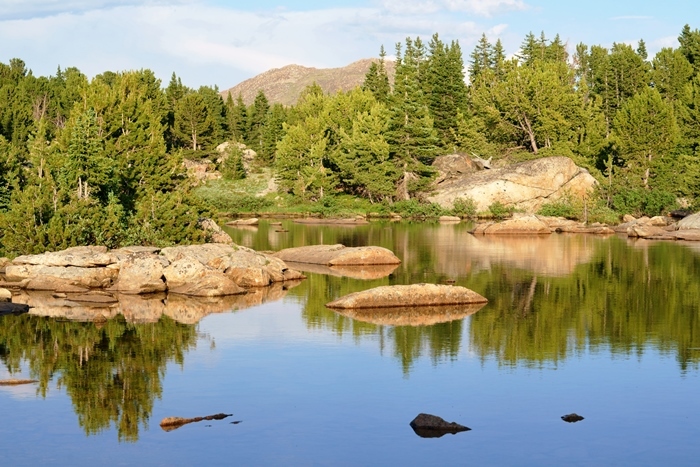 The Beartooth gives you just a small taste of this mountain wilderness. A couple of twists and turns beyond the pass, there’s a nice little hill at the side of the road. 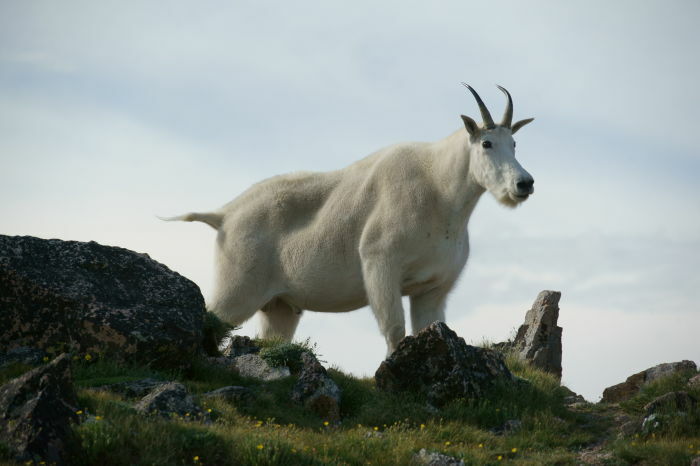 You can easily park here and scramble up to the top of this pile of rocks where, if you’re lucky, you’ll find a mountain goat. You can also take a seat and dangle your feet over the edge of the cliff. If the pass is crowded, this is a good place to find some solitude for a while. … I realized these little ponds were quite spectacular. I spent about a half-hour here, in the fleeting glow of the sunset, taking pictures. Oh, and I did experience some wildlife — assuming mosquitoes count. They were ferocious, but the scene was so beautiful, I decided to sacrifice some blood. Jumping back in time once again, a little while before sunset I found this nice scene on the southwest side of Beartooth Pass, below the ponds. This dirt road is actually a driveway leading up to a trailhead parking area, but it still provided a nice photo spot. After my altitude-induced nap, and before I drove back up to the pass, I headed in the opposite direction from the Top of the World Store and ended up at Clay Butte Lookout. 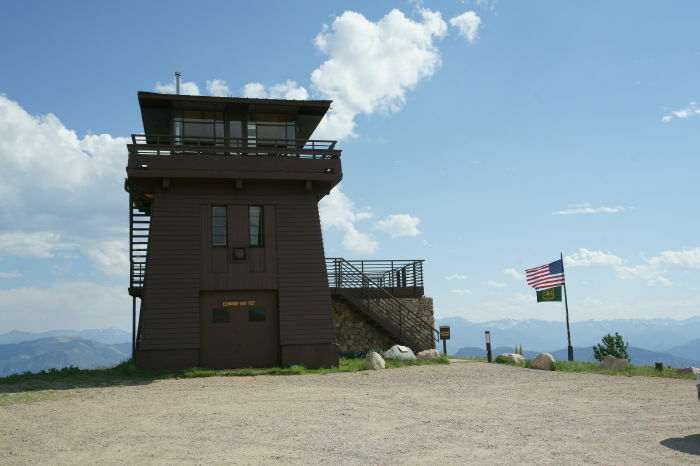 This old fire tower is open to visitors during the tourist season. There’s a dirt side-road that leads up to it, and if you’re lucky, both the road and the fire tower will be open when you visit. I’ll give you a closer look at the Clay Butte Lookout on a separate page. 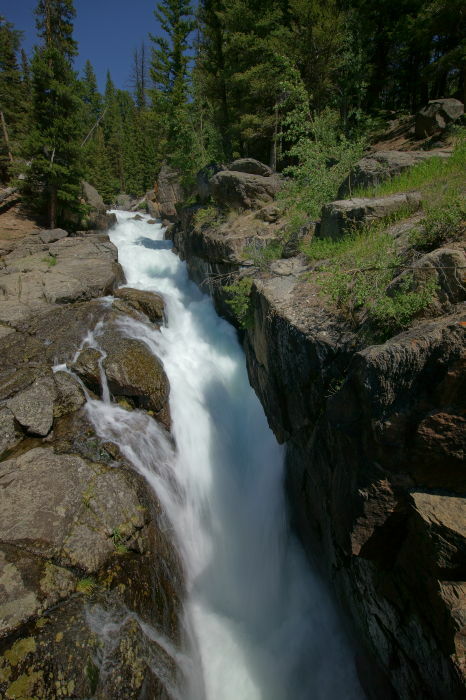 Also on a separate page, I’ll show you more of Lake Creek Falls — a nice waterfall near the side of the road, not far from the turnoff to Chief Joseph Highway. This almost-hidden attraction also preserves a section of the historic US 212 highway. 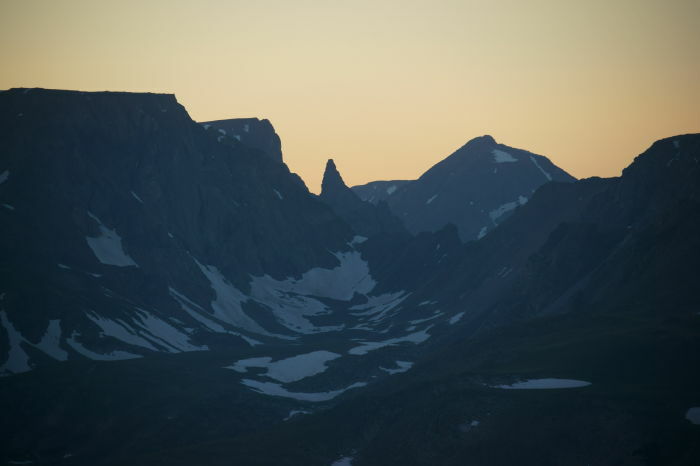 Once you’re on the southwest side of Beartooth Pass, a pair of distinctive peaks will, no doubt, catch your eye. 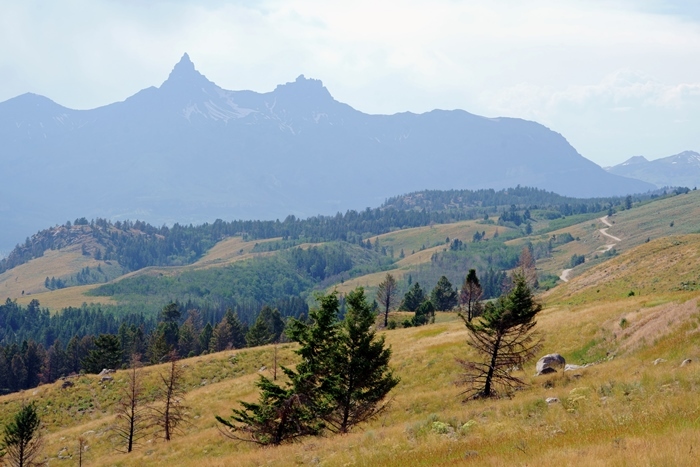 These are Pilot and Index Peaks, located in Wyoming, just south of the Montana line, and just south of Cooke City, which is where the Beartooth Highway is eventually headed. That means you’ll get to stare at them for quite a while, as you drive on towards Yellowstone. 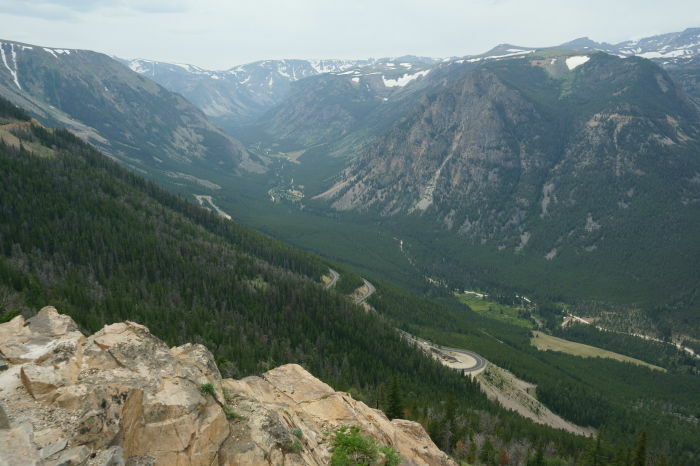 The views along the Beartooth Highway are incredible. You’ll need to plan a few extra hours to drive this road, just to stop and see everything. 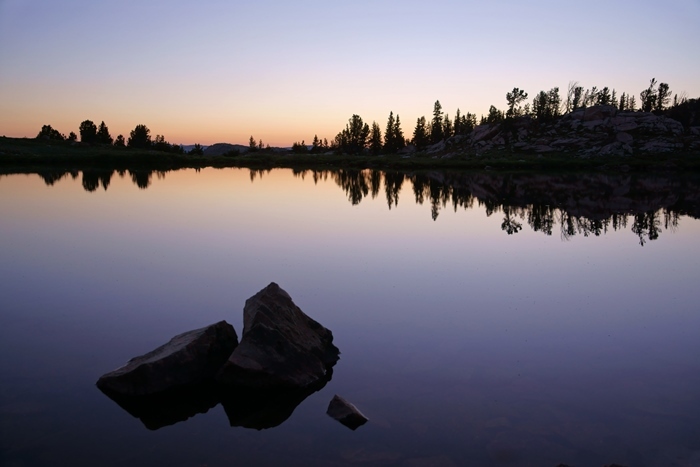 If you are planning to hike, or hope to catch a sunset along the Beartooth, you should seriously consider spending an extra day here — either by spending the night in Red Lodge or Cooke City and backtracking or by staying at the Top of the World Motel. There’s more than enough to enjoy along this route over a couple of days.